We’re open 6 days a week, plus our after hours service provides you 24/7 assistance in emergencies. Call to make an appointment during our extremely flexible consulting hours. Roma Veterinary Clinic provides modern, professional and affordable health care for your pets and livestock. We aim to make your pet feel at ease in our clinic with a caring and gentle approach to treatment and consultations. Our dedicated staff and leading veterinarians are all passionate about pets and caring for their well-being. We aim to look after your horses and livestock with the same professional attitude, providing quality veterinary service and advice when you need it. At the Roma Vet Clinic, you’ll be fully supported with sound advice first and foremost. We know that helping our clients starts with providing a good understanding of health care issues and treatment options. With good advice and professional recommendations, you’ll be well equipped to make the best ongoing health care decisions for your animal/s. With fully equipped examination rooms, diagnostic machines and pharmaceutical stores we provide on-the-spot assistance for nearly all pet health and medical needs. Take a moment to meet our team and our own pets. We look forward to seeing you and your animals again at the next scheduled visit. 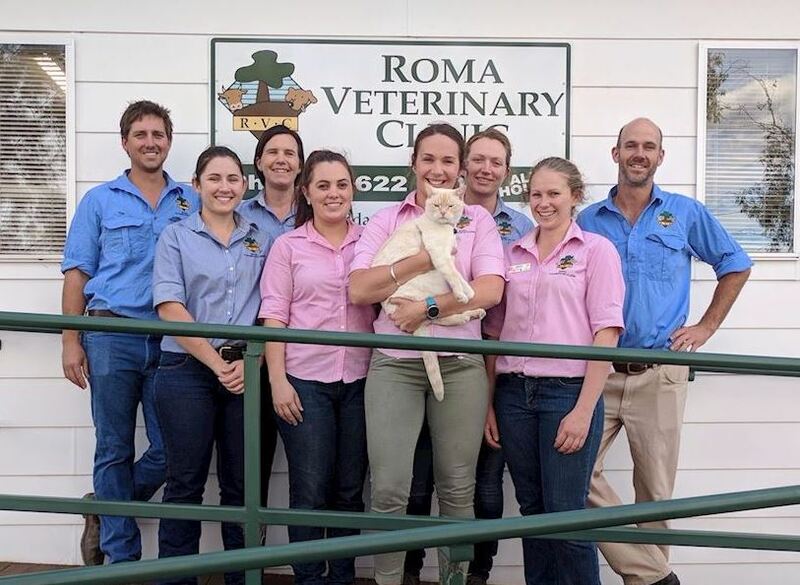 Roma Vet Clinic has been an integral part of our local community since 1975. In that time, we have grown to a 6 vet practice, focussed on providing the best for your animals. Being so strongly integrated with our local community is important to us and our clients. Our customers know by experience that they can rely on us for sound advice and treatment options and that their animal is in the very best hands with our team.